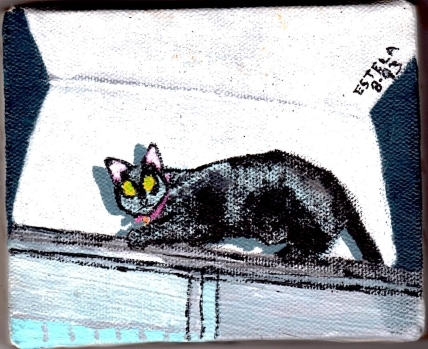 Painting of my cat Rude-E (RIP) on the shower door. Acrylic by Estela. Every time I hear Mary J. Blige sing “No More Drama,” I cry. or else you will get burned. You ever hear about “crabs in a bucket?” If you put crabs in a bucket, I’ve been told, and one of them tries to climb out, the others will pull it back down. When people are miserable and/or dysfunctional, they do not want you to succeed or be happy. Crawl out that bucket, and don’t look back. Kiss the drama good-bye. This morning I woke up to the news that Trump beat Clinton. Some people worked so hard trying to get Bernie Sanders elected to run, but Clinton supporters won the battle. Now, look. For the first time in my life I am shocked at election results. I’ve been disappointed before, to be sure, but NEVER shocked. Ever. After the shock wore off, I realized that it DID cross my mind that Trump might win. I just refused to believe it. I’m like, “Naw, surely…” Good thing I don’t care anymore. No more drama for me. Whatev’s. Some people wept last night to hear the news. Some people feel afraid. Some people are angry. Me, I’m amused. I no longer buy the rhetoric or the platitudes. I lived through Reagan, two Bushes, Clinton, and Obama. I’m not afraid, and at the same time can’t be more afraid than I already have been for a long time. To stop being afraid, is to let go of the drama. I don’t want to be afraid. It isn’t what Trump says that matters, anyway. It’s what he will do. We don’t know what that will be. Let’s see if he will “make America great again.” (That presupposes that America isn’t great right now.) Does it mean he’s going to bring back manufacturing to this country? Because that is what made everything peachy. I really doubt that is going to happen. I have no idea what his plans are. If he has any. All I know is that life goes on, and change happens. Like when the Pinta, Niña, and Santa Maria crossed the Atlantic. Change is the only constant. I think it’s hilarious that Donald Trump won. Donald Trump is the next President of the United States of America. Wow. Anything is possible in this world. Anything. That’s exciting and also frightening. But I don’t want to be afraid. I prefer to be amazed and amused. Fate called it. History now has it. I accept that. This entry was posted in Autobiographical, Philosophical, Uncategorized and tagged Bernie Sanders, change, Clinton, drama, fate, history, life, No More Drama, President, Trump. Bookmark the permalink.